Dr. Napolitano and the entire staff was warm, welcoming, comforting and efficient even to the biggest scaredy cat around!Would highly recommend!! Dr. Napolitano and the entire staff was warm, welcoming, comforting and efficient even to the biggest scaredy cat around! Would highly recommend!! Dr. Ron Napolitano is a lifelong Staten Islander. He is a graduate of Monsignor Farrell High School, as well as Fordham University, where he majored in biology. 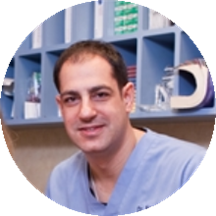 Dr. Napolitano received his DDS degree at New York University's College of Dentistry and has attended many implant and cosmetic courses post-graduation. He is an active member of the American Academy of Cosmetic Dentistry, Academy of General Dentistry, American Dental Association, New York State Dental Association, and Second District Dental Society. Dr Napolitano is vey comforting...Eases all your Anxieties... Answers all your questions so you understand.. The entire Staff is Great.. I give 5 stars .... :>) Barbara T.
Very friendly staff, no wait, great dentist. He is the best!! A true professional. Also office staff is friendly and knowledgable. The staff was very friendly and helpful. I felt very comfortable and welcomed. The consultation was thorough. a very pleasant experience,took the fearout of me of visitng a dentist. I felt ,I was in good hands.